Kate MacGarry is pleased to present a new film by Ben Rivers in his third exhibition at the gallery. Things is a lyrical analysis of the objects we gather around us, split into sections loosely based on the seasons. It begins with Winter, shot on black and white film developed by the artist in his kitchen. This cottage industry approach to filmmaking lends the film a raw and imperfect touch and sets the tone for the personal nature of the film. Rivers has used as his subject a collection of objects, sounds and images that hold fascination for him in some way. These range from Lascaux cave paintings to scraps of music, stills of magicians and American amateur actors. The apparent simplicity of the Winter section points towards primitive image making and is notably inspired by early cinema. 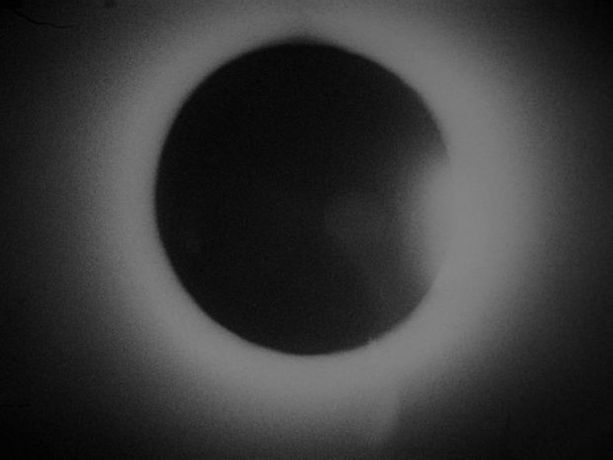 In one scene, the image of an eclipse is distorted and set against black noise. As the camera tracks back, a simple cinematic trick is revealed which nods to the world of trickery and illusion in cinema. As the seasons change, parallels and associations are made with things previously seen; an intricate web of clues to a life there to be unpicked. Things recalls Xavier de Maistre's 1794 novel Voyage Around my Room in its attention to the minutiae of life and the way in which poetic imaginings can be revealed in the ultralocal. The film is a collision of individual fragments of video and sound, which together complete an abstract yet intimate picture. One of the most memorable scenes in the film occurs in the Summer section where we witness a squirrel circling a coconut model of another squirrel: quizzical enquiry gradually turns to all out attack. In its attention to small moments, Rivers' film is a rumination of the things we gather around us. Ben Rivers, born in 1972 in Somerset, England, lives and works in London. He has been awarded the 2013 Artangel Open Commission, the product of which will be presented in 2015. Recent exhibitions include Ben Rivers at Temporary Gallery, Cologne, 2014; Ah Liberty! at The Douglas Hyde Gallery, Dublin, 2013; Phantoms of a Libertine at Kate MacGarry, London, 2012; Ben Rivers at the Hepworth Wakefield, 2012; Sack Barrow at The Changing Room, Sterling and Hayward Project Soace, London in 2011 and Slow Action at Picture This, Bristol in 2010. A Spell to Ward off the Darkness, by Ben Rivers and Ben Russell, will be released in cinemas in the UK on 12 September 2014 by SODA Pictures. An LP of the soundtrack will be released by op50. Things was commissioned by Film and Video Umbrella as part of Stay Where You Are. With thanks to Arts Council England, Jerwood Charitable Foundation, Gareth Evans and Aldeburgh Music.